TRADITION for its own sake is worthless without a vision and a purpose for the future. 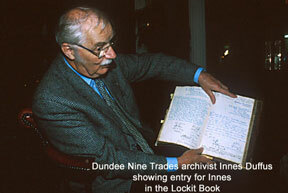 S INCE the 16th Century at least nine trades have advanced the interests of trade in the City of Dundee. These trades are fully autonomous but have incorporated and are known as the Nine Incorporated Trades Of Dundee. Also in existence are the Three United Trades who are involved in the Building Trades. Baxters or Bakers, Cordiners or Shoemakers, Skinners or Glovers, Tailors, Bonnetmakers, Fleshers, Hammermen, Braebeners or Weavers and Listers or Dyers. The Trades have always maintained a very strong connection with the church. For much of the 18th Century the three parish churches in Dundee were cared for by the town council and a kirk session. In the 1770s it was decided that Dundee needed another church, but the town council would not fund the building. The Twelve Trades therefore agreed to pay for two thirds of the sum required, and St Andrews Church, 'The Trades Kirk', was built. In 1775 the Trades, led by their Deacon Convener, marched in procession from their meeting place in the Howff to the opening of their church. The strong connection is maintained by the Trades and the church. Stained glass windows representing the Nine Incorporated Trades and the Three United Trades are on either side of the pulpit and more recently two further windows in memory of a dearly loved chaplain, Rev T. R. S. Campbell, were donated by the Trades. These are certainly worthy of a visit. The trades also have a 'Kirkin' ceremony each year, currently held on the Sunday nearest St Andrews' Day when a dedication service is preached by the minister of St Andrews Church who is Chaplain to the Trades. The roots of the Hammerman Incorporation lie lost in the early days of Scots' History. Like many other early records those of the Hammerman Craft were assumed to have been lost when General Monk sacked the City. The earliest surviving records therefore date the Craft as 1587. However there is a record of the Craft under its Deacon, Alexander Moir, dated 1525 when the Hammermen undertook to provide sustentation for a chaplain to 'sang and say God save us' before an alter to St Eloy, their patron saint, at the northmost part of the north aisle in the town kirk, which they would maintain. The chaplain was to carry out his duties just as the chaplains of the 'lave (rest) of the crafts of the burgh does'. Long before this, however, Hammermen of all kinds were working in the burgh. A local armourer, Wat Moncur, frequently supplied James 1V with specially made suits of armour. Another Moncur, John, was working in Dundee in the 1440%. In a town as important as Dundee where gold and silver ornaments were worn on belts and used for buckles there were a good many Goldsmiths and Silversmiths in the Craft. Craftsmen were and indeed are required to take the oath upon entry to the craft and no one shall be fully qualified until they have made the following declaration. 'i shall be leall and true to our Sovereign and to the Provost, Bailies and Council of Dundee and to my Deacon of the Hammerman Craft thereof, present and to come. I shall maintain and defend the word of God and his Evangel which is presently professed amongst us, so far as lies in me, and shall never decline therefrom. I shall obey my Deacon of Craft. I shall obtemper and fulfil all laws and statutes made, or to be made, for the liberty of my said Craft, and we/fare thereof. I shall make concord among my brethern where discord is. I shall fortifie the common weil. I shall use myself uprightly in my ca/ling. I shall relieve the poor and needy, and help support the widow and orphan to my power. I shall use no fraudful dealing. I shall also use no unfreeman's goods under co/our of my own. I shall assist the Deacon and brethern of Craft in al/respects that tend to the liberty of our said craft and, as far as possible, I shall attend all the meetings when ca/led thereto. I shall never contravene, directly nor indirectly, all just and lawful statutes made for the welfare of the said Craft. I shall be no mutineer, nor raiser of tumults nor discords among my said brethern. So help me God. The Seal Of Cause has been lost but the Nine Trades' Inventory of Charters includes what purports to be a copy, giving the date as 21st September, 1525 during the Deaconship of Alexander Moir. Early records show that two Cutlers were before the burgh court for 'invading'their Deacon, one Silvester Ramsay, with a 'winger' (dagger). This happened some time before 1587 because Patrick Ramsay, who was Deacon in 1587, was the son of Silvester. The Iockit book, now rebound, was repaired at an earlier date and many of the pages are out of sequence. It is fair to assume that some were lost altogether. One record in 1602 gives licence for a Hammerman from Strathdichty, David Thoms, allowing him to work in Dundee by paying a weekly penny to the Craft. This was one way in which the Craft retained the work for its own members within the town. The constant money worries showed very real concern for the poor and needy, the ageing craftsmen and their widows and orphans. Their well-being was of paramount concern and the Deacon had authority to give immediate relief and recover the money later when he cleared his accounts at the end of the year. Bearing in mind that there was little or no opportunity for a craftsman to save during his working life, this was the only lifeline to those who fell on hard times. This part of the Trade's work continues to this day, although there are fewer opportunities to show this benevolent side without infringing some of the social benefits to which these people are entitled. The protectionism mentioned earlier was done partly by limiting the number of people who could be trained in the craft by insisting upon a long period of training i.e. seven years plus two as servant or eight and one followed by an 'essay' or test piece set by the Deacon. Outsiders or unfree men were ruthlessly dealt with. Penalties were also severe and these can be read in the Rules and Bylaws of the Craft. Around 1653/4 Alexander Guthrie, a saddler, was expelled from the Craft for striking the Deacon and 'other causes not to be publish'. In fact he had been guilty of 'filthie carriage to his brethern by lying daily to the English commander'. This was not the result of anti-English feeling because the Craft had two Englishmen in their ranks at that time. Discipline, however, was sharp and swift. It also shows that the English were not unwelcome and had support in the town. More than thirty crafts figure in the Hammerman records such as Armourer, Bucklemaker, Blacksmith, Gunsmith, Goldsmith, Silversmith, Jeweller, Clocksmith, Watchmaker, Knocksmith, Cutler, Sword Slipper, Locksmith, Farrier, Saddler, Lorimer, Brassfounder, Plumber, Pewterer, Guardmaker and Potter. Due to irreconcilable differences, the Goldsmiths were given permission by the Town Council to separate from the Craft, although the records show that many still retained heir membership of the Hammerman. In the 16th and 17th Century Dundee guns were famous all over Europe and were much sought after. A high proportion of the Trade between 1587 and 1620 were Gunmakers with the Ramsay and Alison families featuring prominently. Sadly, very few guns of the 'fishtail'and 'lemon but' design were superbly crafted and there is an example of each in the National Museums of Scotland, Edinburgh. The Craft worked hard at keeping their monopoly. Keeping the work of the unfree out of the burgh on the grounds that it was not up to standard was one ploy used and, since the Craft was the sole judge of standards, it was an effective method of keeping outsiders from trading and for ensuring high prices for their own products. Only the Deacon, for example, was allowed to buy the 'smiddy coal' for the forges as it arrived at the Port. He ensured that it was separately weighed to ensure that the poor fund got its just dues. In 1699 Journeymen were charged £1.10/- if they moved from one master to another. The master was charged 10/- if the servant stayed for more than a year. In 1846, by Act Of Parliament, all trade privileges were abolished and the authority of the Trades was slowly eroded, including removing their rights to sit on the Council, until the present day when the Trades are reduced to doing charitable works, mostly connected with education, and acting as a pressure group. The industrial life of the City has been greatly enhanced by members of the Craft and it could be said in all modesty that without the Hammerman Craft of Dundee its industrial future would be bleak indeed. The Craft continues to expand its interests into new technology and is sure to play an important part in the life of Dundee. Applications to the Incorporation are welcomed from men over 21 years of age who are engaged in or who are qualified to engage in any Trade in which the working of metal and the use of the hammer plays an important part.